A special William S. Burroughs event in London on Wednesday, 30th May will see Master Musicians Of Joujouka manager and producer Frank Rynne in a Q and A conversation with counterculture legend Barry Miles on the subject of Burroughs’ London years. Miles ran the Indica Bookshop and Gallery in the courtyard of the building in Duke Street, St James’s where Burroughs, artist Brion Gysin and filmmaker Antony Balch lived. His connection to the 1960’s counterculture and the Beats runs deep. Miles was also editor of the seminal publication International Times. In 1972 he engineered the second MMOJ LP The Master Musicians Of Jajouka – The Primal Energy That Is The Music And Ritual Of Jajouka, Morocco. While Burroughs was the first person that Brian Jones of the Rolling Stones played the recordings of Joujouka he made in 1968 to, arriving in the morning to the El Minzah Hotel in Tangier to play them to Burroughs in his room – later released as Brian Jones Presents The Pipes Of Pan At Joujouka (1972). Miles authored the official biography of Allen Ginsberg, William S. Burroughs, A Life, Call Me Burroughs, A Life and The Beat Hotel as well as innumerable books on music and the history of the counterculture in the UK. Asking the questions will be Frank Rynne, who continues to uphold the Beat legacy. Rynne organised the Here To Go show in 1992 in Dublin, the first major exhibition to include the paintings of Burroughs and Brion Gysin – and featured a live performance by the Master Musicians Of Joujouka. He also researched Man From Nowhere: Storming The Citadels Of Enlightenment With William S. Burroughs And Brion Gysin. Rynne has managed the Master Musicians Of Joujouka since 1994, producing the albums Joujouka Black Eyes, Boujeloud and 10%: File Under Burroughs (featuring the Master Musicians Of Joujouka, Hamri, Burroughs and Gysin). The Live In Paris album from the Master Musicians’ concert at Centre Pompidou Paris in 2016, is due to be released later this year. The concert was part of the events programme as part of the museum’s major Beat Generation retrospective. The Q and A session, part of Salon For The City’s Naked London Lunches series will take place at Westminster Arts Library, London at 6.30pm on Wednesday, 30th May. 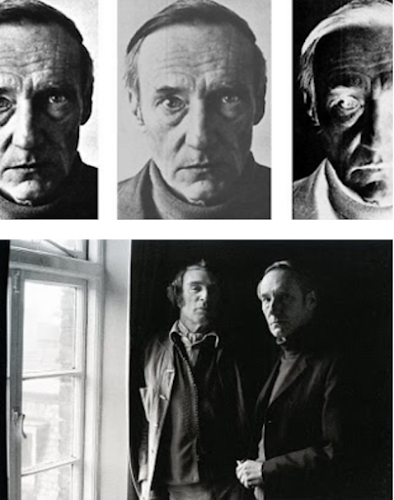 An exhibition of Miles’ personal photos and ephemera chronicling Burroughs’ time living in London will also be on display from 7th May to 2nd June. There will also be a guided walk of Burroughs’ London on Saturday May 26th with writer Antony Clayton and esoteric scholar Dr William Redwood.